Few industries have had to adapt more to changes to consumer behavior than the music industry. The way music is produced, distributed, sold and bought has undergone transformational change, leaving industry players with little time to catch up and collaborate. 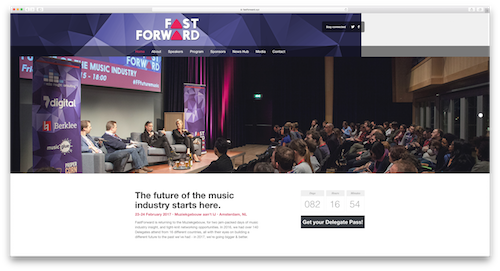 This week’s #WebsiteWednesday connects young professionals and established music industry executives alike at a conference that is helping to shape the future of the music industry – FastForward.xyz. FastForward is an annual conference held in Amsterdam that brings together the future leaders of the music industry, with an average age of 35 or younger. The convention features keynote speeches, panel discussions, and presentations from rising industry stars, like Fred Bolza of Sony Music, Emily Lovell of Warner Music Group, and Cherie Hu of Forbes, amongst others. All of the discussion topics deal with where the industry is headed, and how to innovate beyond their traditional markets. Technology in general is a main topic at 2017’s FastForward, and several experts will be speaking on the impacts that emerging tech like augmented and virtual reality will have on the music industry. Their ‘Fast Fifteen’ presentations have also become a hallmark of the conference. They are quick and thorough fifteen minute discussions by industry experts on emerging trends in the different aspects of music and technology – ranging from topics like social media to vocalistic style. After learning about FastForward.xyz, we couldn’t help but draw parallels to Deloitte’s own leadership communities like Exponentials.xyz and FutureFin.xyz, which we covered in March 2016 and earlier this month. It’s only fitting that FastForward chose to take their community a step further by helping global leaders connect in-person. And like .xyz, FastForward is providing a platform for innovators to develop and share their forward-thinking ideas. By doing so, FastForward.xyz and other members of #GenXYZ are making big strides in shaping our future.